What a blog post title! Epistolary Diatribe … what??? But have no fear … it’s not as scary as it sounds. This article will really help you understand the letters of Paul. I promise. Let me begin by asking you a question … If you had no quote marks, how would you indicate in a book or letter that you were quoting someone? Well, you would probably just state the quote anyway, and then use words like “said” to tell you reader you are quoting something. Gary said I love elephants. But notice that without quote marks, the sentence loses clarity. Gary said [that] I [Jeremy] love elephants. Do you see? Without quote marks, one sentence can have at least two different meanings. But it gets trickier than that. 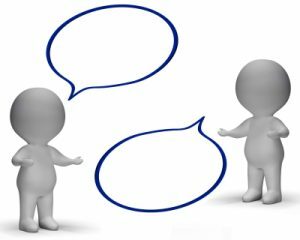 What if I am writing a dialogue between two or more people, and I now have to record what each person says … still without quote marks. Tom said I love them too. But I said both of them are wrong. So you see? What EXACTLY was said is a little vague, but the context gives you some idea of what Gary, Tom, and I were talking about. That’s one small step for a man; one giant leap for mankind. Now, take the little bit you’ve learned here about quote marks and easily-recognized quotations and think back to the days of the early church when Paul was writing letters to the various churches he had planted. Many times, Paul wrote these letters to correct and refute some of the false ideas and teachings that were being taught within the various churches. But guess what? There were no quote marks in Koine Greek (the language Paul used to write his letters). Well, he used a style of writing which was quite common for other letter writers in his day, which modern scholars have labeled “Epistolary Diatribe.” This is a fancy way of saying “A letter written to correct the wrong ideas of someone else.” And since this method of writing letters to refute others was quite common, people quickly and easily recognized it when it was happening in a letter. This is especially true when we recognize that trained “readers” often “performed” the dialogue portions of the letters to a listening audience … many of whom could not read. These four clear signs are not always present, and so it is sometimes difficult to know whether a certain verse is Paul’s idea or a quote from someone Paul is refuting, but there are several very clear examples of this sort of “Epistolary Diatribe” going on in the New Testament. From this, we see that Paul thinks that God has set up the world in a way that God’s will can be resisted. The objector disagrees and says that nobody can resist God’s will. Paul responds with a bit of irony, telling the objector, “By saying nobody can resist God’s will when God has said that people can resist His will, you are resisting God’s will.” It’s a brilliant move by Paul. I write more about this in my book, The Re-Justification of God, which looks at Romans 9. 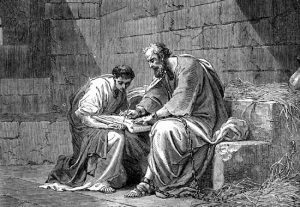 Paul’s letter to the Corinthians is full of Epistolary Diatribe, especially since he is responding to a letter they wrote to him. So he quotes some of their letter, or what he heard that some people were teaching in Corinth, and then he responds to it. Then Paul quotes what they are saying, “How are the dead raised up? And with what body do they come?” In other words, the objector says that the idea of a resurrection is foolish unless we understand how it works and what our new bodies will be like. Paul then sets out to refute this objection with a little gentle name-calling. He introduces his refutation with the words “Foolish one” and then goes on to explain more about the resurrection. Note that the adversative conjunction was missing, but it was still quite obvious that Paul was engaging in dialogue with this other teacher. It is not just Paul that uses Epistolary Diatribe. As mentioned earlier, this form of writing was very common. James, the brother of Jesus, uses it as well in his letter. A clear example is found in James 2:18-20. In fact, recognizing Epistolary Diatribe in James 2 helps clear up a lot of the confusion surrounding James 2 and the role of faith and works in the life of the believer. James is writing about the relationship between faith and works, and he introduces the objection by someone else in the normal way. He writes, “But someone will say.” And then James goes on to quote this ideas of this person who is objecting. The interesting thing about this is that few Bible translations understand where the quote from this imaginary objector ends. If you consult some of the various Bible translations, you will see that in English, the end quote is inserted at different places in different translations. The NKJV puts the end quote half-way through verse 18. The NAS puts the end quote at the end of James 2:18. But when we understand the signs of Epistolary Diatribe, we recognize that the quote of the objector goes all the way through verses 18 and 19. How do we know this? When we realize that James 2:19 and what it says about the faith of demons is not the ideas of James, but the ideas of someone who disagrees with James, this helps our overall understanding of the passage. I wrote more about this in my article “Even the demons believe” and have also taught about it in my study on James 2:14-26. So those are just three clear examples of Epistolary Diatribe in the New Testament. There are several other clear examples, but I just wanted to point these out. Now, there are many, many other passages in the Bible that likely contain Epistolary Diatribe. The problem with several of these other possible passages that contain Epistolary Diatribe is that they don’t always contain all four of the markers that I mentioned above. They might only contain one or two. Or none. But again, what we have to recognize is that while it might be difficult for us to discern when Epistolary Diatribe is taking place, it was not difficult for the original audience. They likely would have had someone play-act the dialogue out for them, with the reader using different voices, or maybe different hand gestures to indicate when a different person was talking. Also, they would have quickly and easily recognized the ideas and quotes from the teacher that Paul was refuting in his letter. There were four intentional quotes from other sources in that paragraph. The first was from Franklin D. Roosevelt, the second from 1 John 4:18, the second was the old marketing slogan from the 80’s and 90’s, and the final quote came from Isaiah 41:10. It is possible you picked up on all of them, though maybe you only recognized one or two. Now, if I had changed my voice in all the quotes, you would have recognized that I was quoting someone else, even if you didn’t know the source of the quote. This, I believe, is exactly what was happening in the early church as the letters of Paul circulated around and were read in the various churches. So here are a few possibilities of where this is happening. 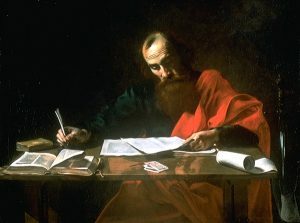 Paul’s letter to the Romans almost certainly includes numerous Epistolary Diatribes in which Paul quotes and then refutes a prominent teacher in Rome. Romans 1:18-32 is sort of the introduction to what this other teacher was saying. Therefore, much of what we read in Romans 1:18-32 is not Paul’s ideas, but the ideas of someone that Paul wants to refute. This is extremely significant, for it is only here in Romans that wrath is clearly attributed to God. Also, it is here that we read about God handing people over to their sin. And all of these ideas do not come from Paul, but rather from a legalistic teacher whom Paul sets out to refute in his letter to the Romans. Do you read Romans like an Arian? This way of reading really helps bring clarity to Paul’s argument in Romans and his theology as a whole. Another sign that Paul is using Epistolary Diatribe in Romans in found in Romans 3:1-9, and 27-31. There is a back-and-forth dialogue that seems quite obvious and natural in the letter. 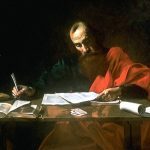 When we rightly discern which ideas are Paul’s and which ideas belong to the legalistic religious teacher Paul is refuting, the entire text makes much more sense. Read the two articles linked to above for more help on this. As with Romans, the book of 1 Corinthians is full of Epistolary Diatribe. With almost every new topic Paul addresses, he first quotes what was being taught in Corinth, or what they wrote to him in a letter, and then he sets out to answer their question or refute what they are doing and teaching. Corinth: All things are lawful for me. Paul: But all things are not helpful. Paul: But I will not be brought under the power of any. Corinth: Foods for the stomach and the stomach for foods. Paul: But God will destroy both it and them. Paul: (Extrapolating out to sexual immorality from this point about the stomach and food) Now the body is not for sexual immorality but for the Lord, and the Lord for the body. And God both raised up the Lord and will also raise us up by His power. We can do something exactly similar in 1 Corinthians 7:1-2. Paul cautions against this: Nevertheless, because of sexual immorality, let each man have his own wife, and let each woman have her own husband. Do you see? In this way, it is not Paul who is saying that it is good for a man to not touch a woman. It is the Corinthians who were saying this, and Paul is cautioning them against such practices. He goes on to explain why in the following verses. I could go on and on. There are numerous other examples of Epistolary Diatribe in Scripture. For an exhaustive (it’s also an exhausting read … and a workout to even lift) explanation of this technique in Paul’s letters, get The Deliverance of God by Douglas Campbell. It’s an expensive book, and I don’t recommend that everyone read it, because of how technical it is, but he does provide a very good explanation and defense of Epistolary Diatribe. I had an on-stage 5-minute discussion with Greg Boyd at his ReKnew conference last September, and in my closing comment, I hinted at my belief that something else is going on in Romans 1 than what Greg Boyd thinks is going on. My discussion with Greg Boyd begins at about the 20:00 mark. Romans 1:24 says that God gave people up, or handed them over, to their vile passions and depraved hearts. Greg Boyd thinks that this is Paul’s own idea. I think that since this idea does not at all reflect what we see in Jesus, or even what we see elsewhere in the writings of Paul, that we must conclude that something else is going on in the text. And what is that something else? It is Epistolary Diatribe. Romans 1:24 and the surrounding verses are not the ideas of Paul, but the ideas of a legalistic law-based religious teacher in Rome, whom Paul is quotes so that he can then refute him. There are extensive clues all over in Romans 1-3 that this is happening, and I think that this approach helps make sense of these opening chapters of Romans in light of everything else in this letter. So I have mentioned it to Greg, and I have mentioned it to you, but let me say it again: I do not believe that God hands us over to sin and Satan. He does not deliver us up to the destroyer. He does not withdraw His protective hand. He does not “Release the Kraken!” to have its way with us. As we see in Jesus Christ from first to last … God always forgives, only loves, and will never, ever, ever leave us or forsake us, but will be with us, even unto the end of the age. Would you consider the following passage to be Epitolary Diatribe? I do. 34 Let your women keep silence in the churches: for it is not permitted unto them to speak; but they are commanded to be under obedience as also saith the law. That is a really good question. There are a few indicators that this might be another example, especially if the word “your” in v 34 was not original with Paul (it is a textual variant in some manuscripts). Furthermore, Paul does not often like to depend upon the Mosaic law … but tends to supersede it in light of Jesus Christ (as in Romans). It is the legalistic teachers who disagree with Paul who often revert to quoting the law. Also, the statement in 14:34-36 seems to contradict what Paul wrote previously about everybody prophesying in turn (14:31). And then there is the possible refutation by Paul which begins in 14:36. The problem is that Paul seems to say similarly “negative” things about women speaking in church elsewhere (such as in 1 Tim 2:12-14). So the line of thought we find here about women remaining silent might reflect this sort of mindset in Paul. Even if these are Paul’s words, however, the words here (and in 1 Timothy) are clearly descriptive of a special situation at that time, and should not be considered as prescriptive for all churches in all cultures throughout time. Very interesting teaching. Thanks for equipping us with more tools to interpret letters more accurately. Helpful insights Jeremy so we don’t unintentionally misrepresent God. I agree. I cannot imagine God withdrawing from us ever. We may leave but God will hope and wait for us to come back. Superb, so much food for thought. As I re-read it, I was reminded of the trial scene in Shakespeare’s Merchant of Venice, similar back-and-forth on the subject of God’s mercy, done in dramatic form. And thank you for the article about the “silences” of the Bible. You always give me so much to think about.